How to register my SpotCam to another account? There are times that you like to re-register your SpotCam to other MySpotCam.com account, for example, when you give your SpotCam to someone or even sell the camera when you don’t need it. Well, this is actually a quite easy process, all you have to do is to deactivate the camera then you can re-register again to other account by adding the SpotCam to another account. 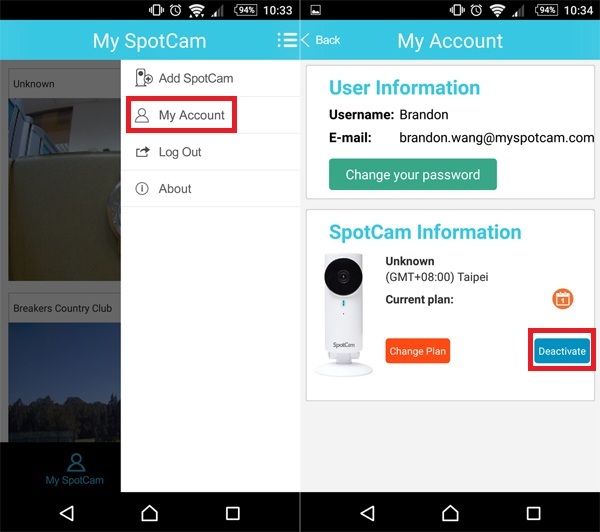 To deactivate your SpotCam, first log on to MySpotCam.com, and enter your SpotCam video page, then call out setting page. In “General” tab of the setting page you will then see “Deactivate This SpotCam” button at bottom. You can also deactivate your SpotCam by using mobile App. Just log in SpotCam App, and call out the side menu, then enter “My account” page. “My account” page will list all cameras you installed under your account, and you can then deactivate the SpotCam in this page. Once deactivation is done, your SpotCam will be reset to factory default, you can then do the same process you did when set up the SpotCam for the first time. Note, make sure you turn the switch at the back of SpotCam to AP mode after you deactivate your SpotCam to prepare for later installation. 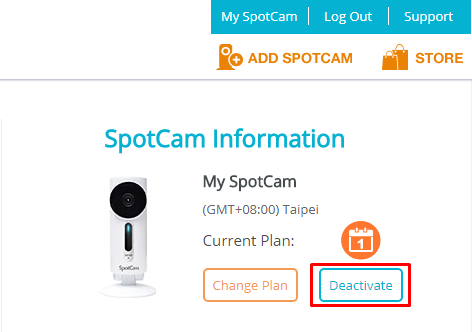 Please be informed the camera must be online when you deactivate your SpotCam, otherwise only registration record on the server will be cleared but not registration in your SpotCam memory. If you’ve deactivated your SpotCam when it was offline, please contact SpotCam support and we will guide you to reset your camera locally. You can also check another article related to this issue here for more information. One thing noteworthy is, once deactivate, all NVR or film video stored on the cloud under the SpotCam will be deleted, so please make sure you back up all the video you need before you deactivate your SpotCam. © SpotCam Co., Ltd. All Rights Reserved.